The Navy will present options on possible ways to clean up 60 acres at Alameda Point slated for a regional park on Thursday night. 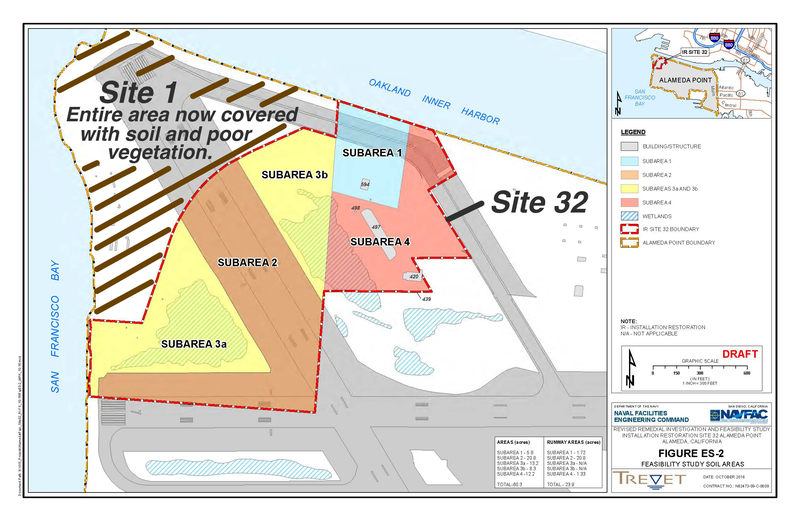 The draft cleanup options for Site 32 represent the culmination of 25 years of groundwater and soil studies that began before base closure was announced. Only five acres have been flagged for cleanup, but uncertainty about what lies beneath the pavement and structures requires a conservative approach. 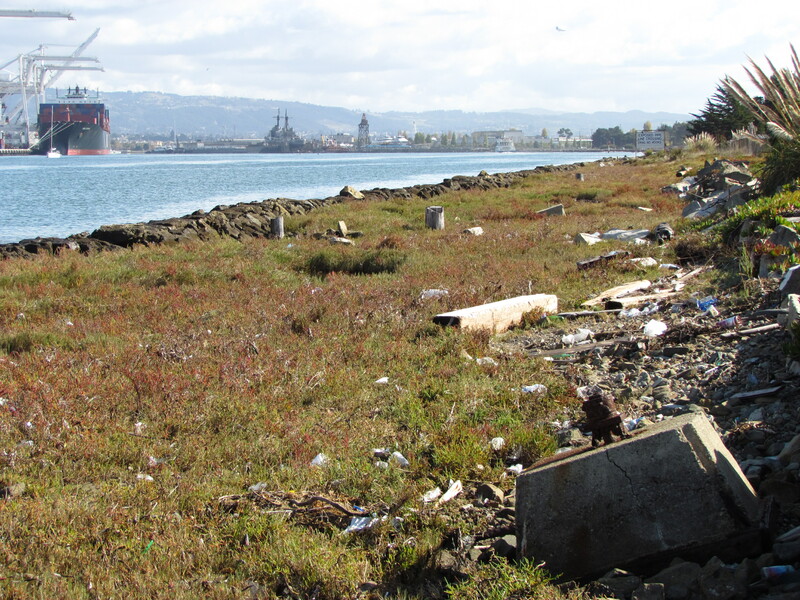 Site 1 at the northwestern tip of Alameda Point was used as the principal disposal area for all waste generated at Naval Air Station-Alameda from 1943 to 1956. 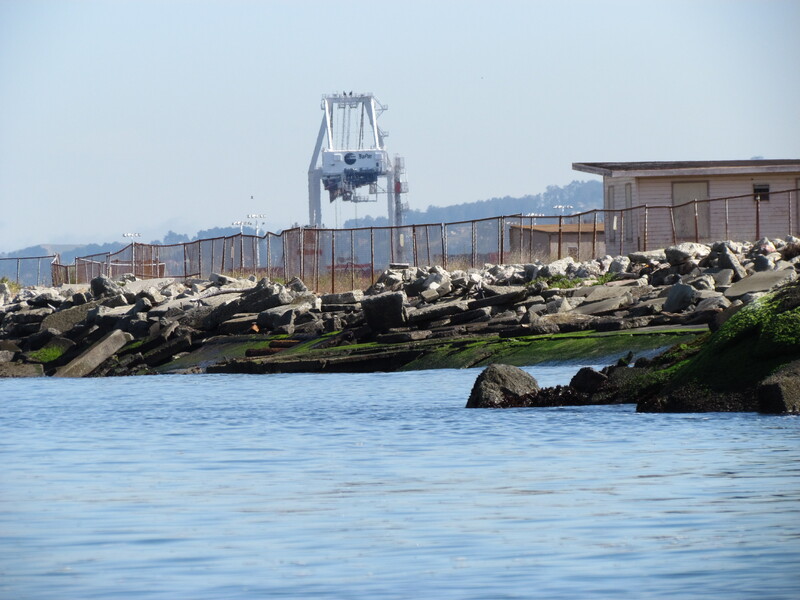 This disposal area, which was once part of the Bay, was created by sinking pontoons and barges in the Bay and backfilling with dredge soil. 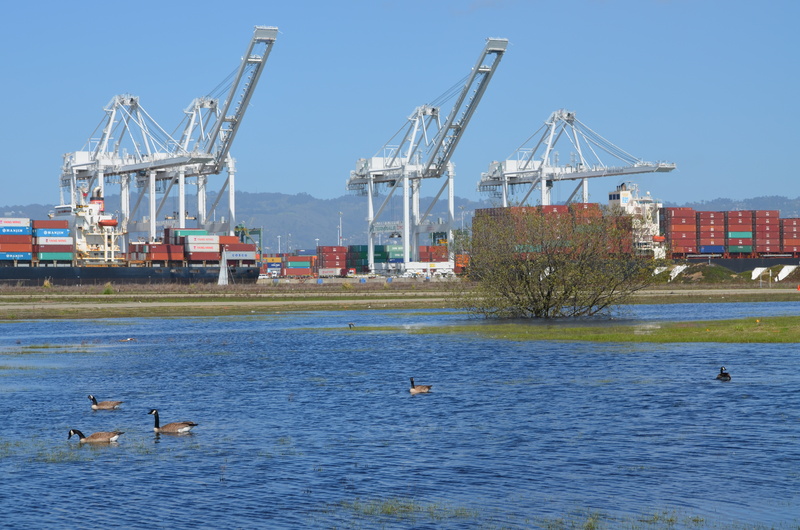 Disposal of cleaning solvents and petroleum products at one unlined pit within the landfill resulted in a groundwater plume that poses a threat of leaching into San Francisco Bay today. In the 1990s the Navy installed an underground barrier system, called a funnel and gate permeable reactive barrier, to stem the flow of contaminants into the Bay. It was not a permanent solution. In July of this year the permanent solution began with the injection of neutralizing chemicals into the plume. San Francisco Bay at Alameda Point western shoreline where threat of solvent leaching exists. Most cleanup activities around the base are aimed at eliminating direct health risks to humans, such as from soil or from vapors that could enter a building. In a few cases, the cleanup is focused first on direct impacts to marine life such as fish, which could in turn cause health problems for people who eat them. The cleanup effort at the Site 1 plume is one of those cases. This effort will keep toxins — solvents, petroleum products, and metals — from ever leaching into the Bay, being ingested by fish, and then consumed by humans. The effort will also reduce unacceptable levels of vapors that are escaping directly above the plume. The future use of the site will be restricted to open space recreational. 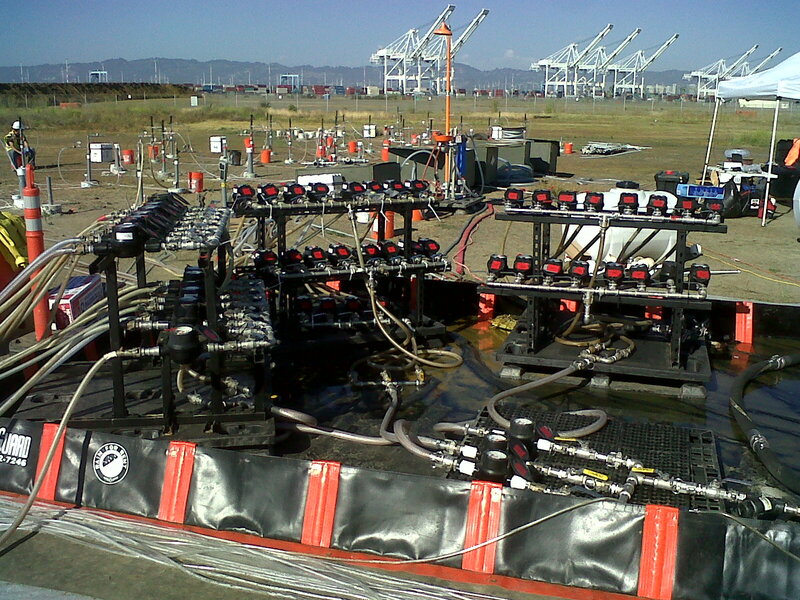 July 2012 – Manifold system of hose lines that send oxidant chemicals to individual wells that go into the underground plume contamination area. Navy photo. The chemical injection process, called In Situ Chemical Oxidation (ISCO), is accomplished by injecting oxidants (catalyzed hydrogen-peroxide and sodium persulfate) into the plume through injection wells. “These oxidants produce short-lived reactions that directly destroy the targeted contaminants,” according to the Navy. Groundwater tests will determine if further treatments are necessary. Tanks of chemicals for neutralizing solvent plume. 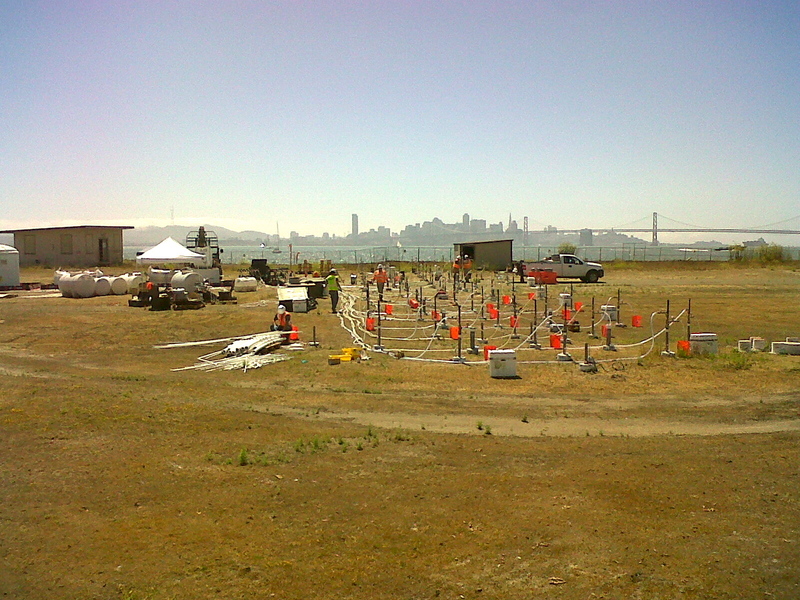 Shown as work area being set up in June 2012. Treatments will continue until either the groundwater is clean enough, or the solvent and petroleum concentration has been reduced by 75%. Once they get to 75% reduction, further injections are more or less a waste of money. From then on, the contaminant concentration is low enough that the remainder will either degrade or disperse and dilute naturally without posing a risk to fish or humans. This process is called natural attenuation and is often relied upon to finish the job when the bulk of contaminants are neutralized and treatment methods no longer yield effective results. The groundwater plume is also contaminated with metals consisting of arsenic, copper, mercury, nickel, silver, and zinc. The metals problem will, in theory, be taken care of when the solvents and petroleum products are eliminated. This will cause the chemistry of the groundwater to change, which in turn will cause the metals to no longer remain dissolved in the water. The metals will return to their solid state and remain where they are. That’s the theory. But to make sure it’s working, there will be a long-term groundwater monitoring program to make sure the metals aren’t moving. If problems arise in the future, the Navy will have to come back and design a new remedy. The Navy is responsible for the landfill’s contents staying in place in perpetuity. Map of Site 1 disposal area with arrow from left indicating plume treatment area. Map also shows outlines of individual unlined pits that were used for disposal of waste. Half of the area is now covered by runway. The Navy opted not to remove the landfill contents because of the $93 million price tag and because the risk of contaminant releases was deemed low. A new set of environmental concerns associated with digging up and hauling away a landfill was also cited during the decision process. The groundwater plume being treated is approximately 30 feet wide by 160 feet long, and it occurs mainly between depths of 5 and 10 feet below the ground surface. Site 1 groundwater treatment work underway in July. San Francisco in background. Navy photo. All of 30-acre Site 1 will eventually be covered with soil and seeded with native grasses. Work on the soil cover was delayed when the contractor discovered that the part of the landfill once used for burning waste was larger than expected. The documentation has to go back through the review process, with a work plan for the soil cover hopefully prepared and ready to implement by 2014. 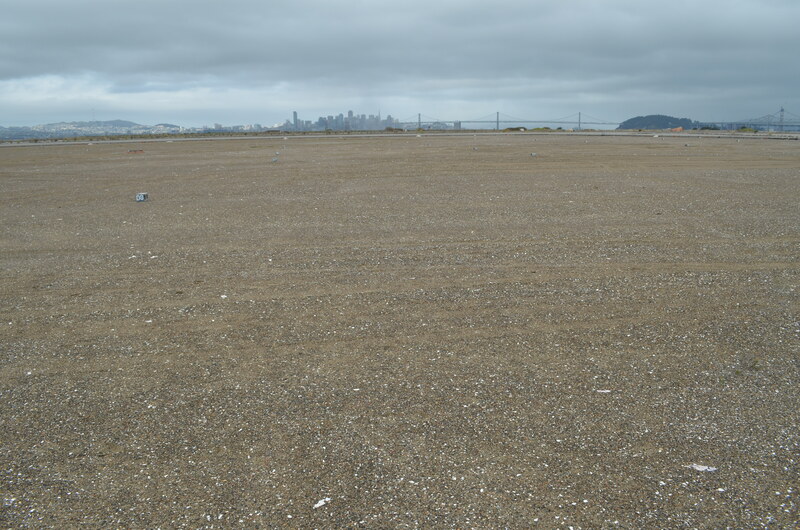 The 4.18-acre cleanup Site 34 in the old runway area next to the Oakland estuary looks barren from a distance. But up close there are concrete slabs and pavement, reminders of its bygone days as a bustling workshop area. This area was once part of the division known as the Naval Air Rework Facility (NARF). Everything from sandblasting and painting, to metal working, woodworking, and scaffold maintenance went on out there. More than 40 years of activity left soil around buildings contaminated with lead, arsenic, pesticides, PCBs, and aircraft and diesel fuel. Above ground fuel storage tanks and electrical transformers contributed to the contamination. The Navy will clean up the soil in this area next year. 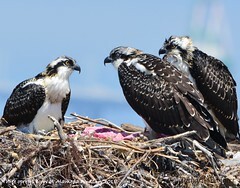 Their draft work plan, which will be released on July 31, was discussed during a Navy presentation at the July 2012 Restoration Advisory Board (RAB) meeting. Site 34 aerial view. Old fuel dock to left of site. Runway at bottom is part of area where antiques faire is held. Navy photo/graphic. Based on more than 200 soil samples taken in prior years and this year, the contractor created the draft work plan. Separate groundwater samples indicate contamination from the solvent trichloroethane. No remedial action is being taken on the trichloroethane, however, because 1) vapor intrusion into residences is not a factor, as this land will become Public Trust Land on which housing is not permitted; and 2) water monitoring has shown that the chemical is not migrating toward the estuary. Site 34 starts at concrete slab on far side of tree. Port of Oakland on right. In late 1800s and early 1900s, trains travelled on tracks along the estuary where tree and slab are. By the time the closure of the Navy base was announced in 1993, this workshop area had 12 buildings, 7 aboveground storage tanks, 2 “generator accumulation points” (waste storage), 15 transformers, and over 7,000 feet of aviation fuel line. Between 1996 and 2000 everything except the concrete pads and pavement was removed. Building demolitions ended shortly after Alameda Point became a Superfund site in July 1999. The Superfund program, officially called the Comprehensive Environmental Response, Compensation, and Liability Act (CERCLA), does not allow for land improvements such as building demolition. Most of the soil cleanup locations are adjacent to the exterior edges of old building slabs. Much of the lead in the soil came from sandblasting lead-based paint. Other contamination came from lubricants used for metals fabrications, and the use of oils and solvents for woodwork and metal work. In addition to removing soil next to the slabs, the contractor will dig under the slabs at the hot spots to take what is called a sidewall sample to confirm that all contaminated soil is removed. They have to keep digging as long as contamination is found. Clean soil will be brought in to the areas where soil is removed. 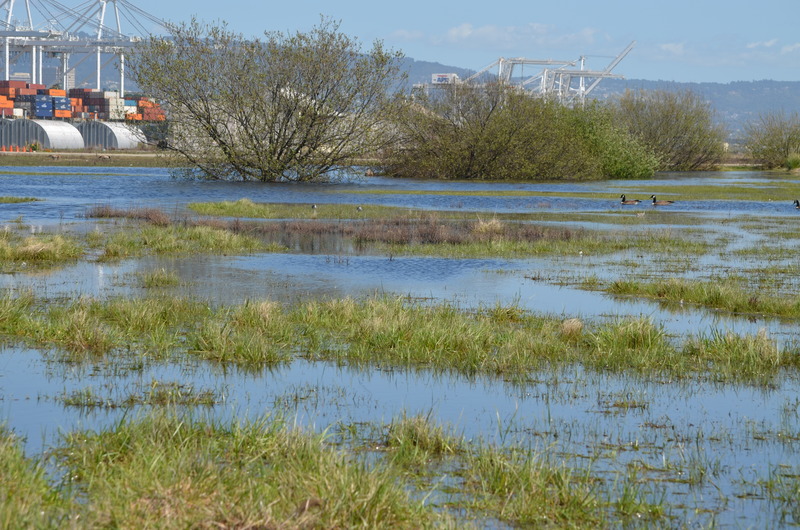 A strip of coastal marshland running along the Oakland Estuary on the north end of the site has no contamination. 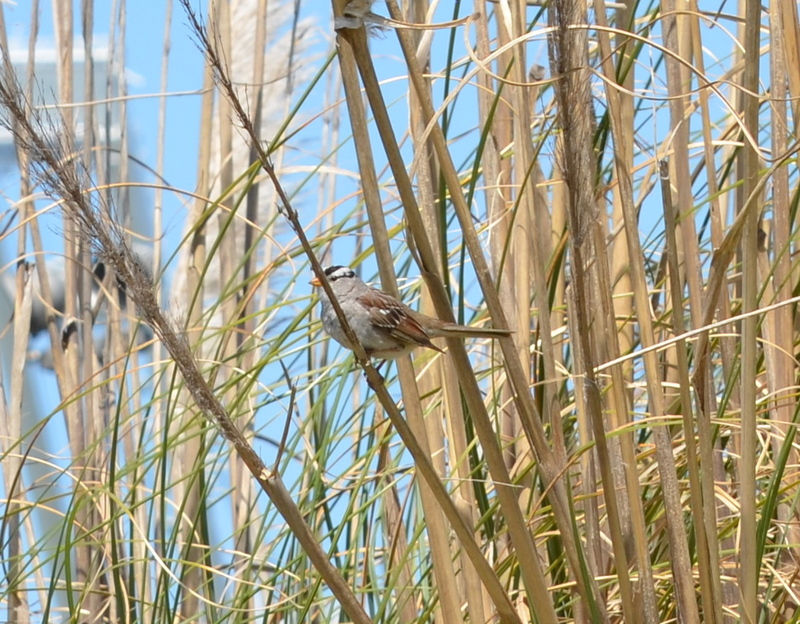 Its habitat quality, however, is marred by discarded concrete, wood, and trash. 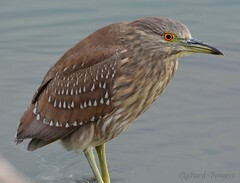 It will be up to the city to initiate wetlands restoration efforts there. 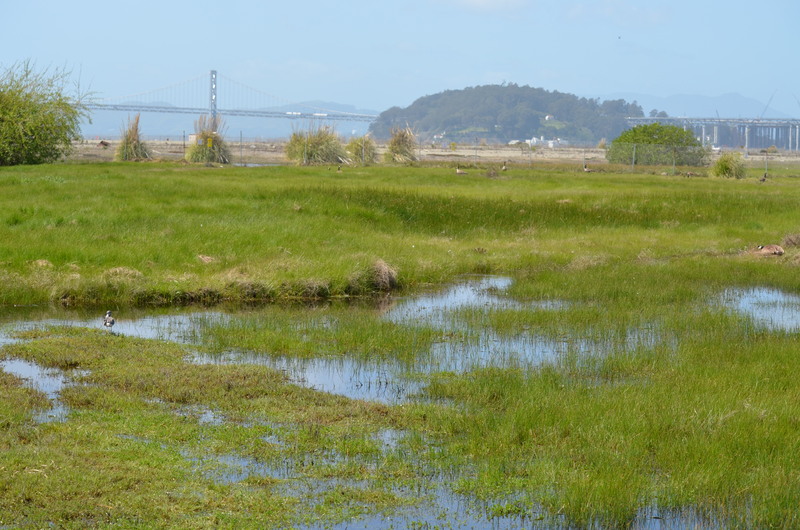 Coastal marsh on Oakland estuary at Alameda Point Site 34. Port of Oakland on left. Old runway area on right. Looking east toward Alameda Main Ferry Terminal. A 60-day public comment period on the work plan begins when it’s released on July 31. The work plan will be finalized in January 2013. Fieldwork is anticipated to take place January through April 2013. 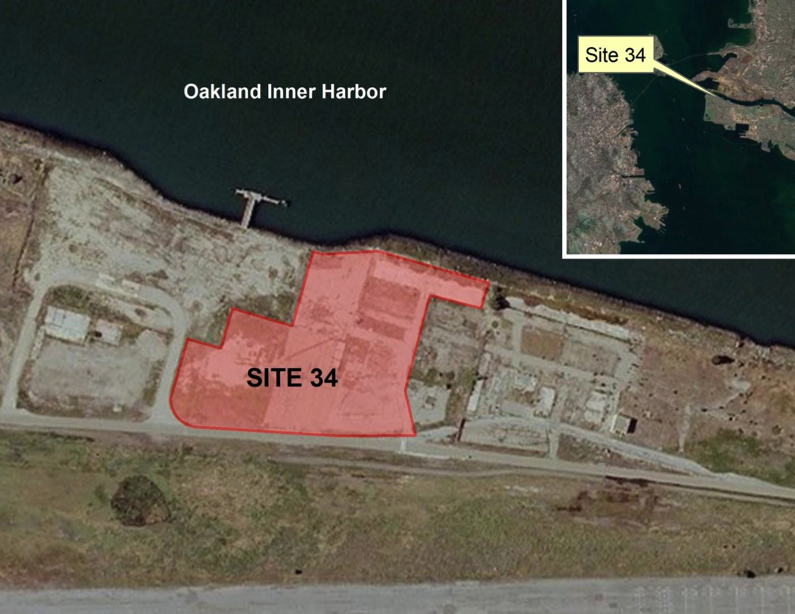 Site 34, located in the Northwest Territories, is expected to be given to the City of Alameda in 2014. Click here > Site 34 RAB Presentation for more details. Golden Gate University’s Center on Urban Environmental Law (CUEL) recently sent a letter to Robert Doyle, General Manager of the East Bay Regional Park District (EBRPD); John Russo, Alameda City Manager; and Larry Janes, Capital Assets Manager for the Veterans Administration Sierra Pacific Network commenting on the ongoing discussion about the location of a VA outpatient clinic at Alameda Point and the management of open space. 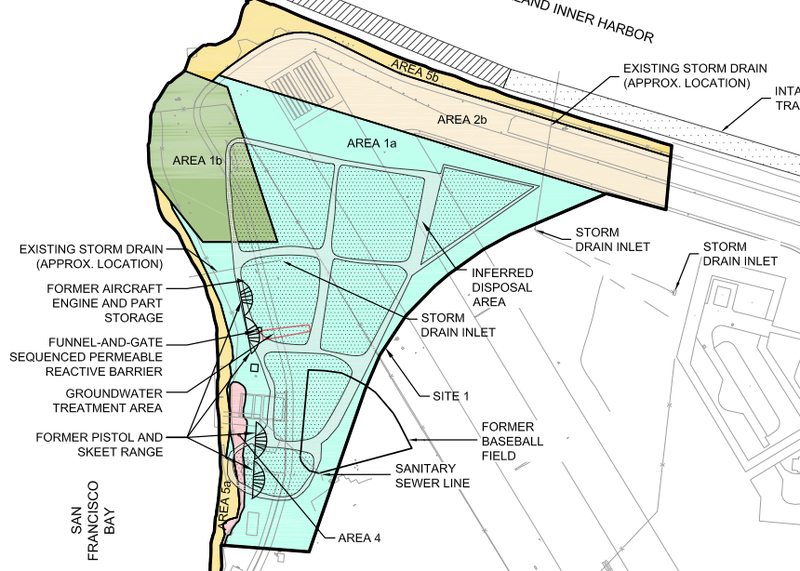 Highlighted parcel at Alameda Point that was offered to the Berkeley Lab for a second campus. USS Hornet and Seaplane Lagoon to the left. While supportive of locating a VA facility at Alameda Point, CUEL questions the wisdom of locating the VA building facilities on the Northwest Territories due to view impairment, earthquake seismic safety, traffic, and transit accessibility concerns. They suggest an alternative site: The one that the city was offering to the Berkeley Lab for its Second Campus. 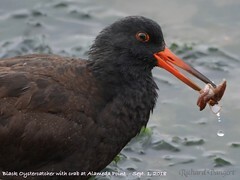 The following was prepared by Leora Feeney, co-chair of “Friends of the Alameda Wildlife Refuge,” a committee of the Golden Gate Audubon Society. Delivered to the Alameda City Council on Monday, March 19, 2012, regarding the city-VA-park district proposal being considered for Alameda Point. 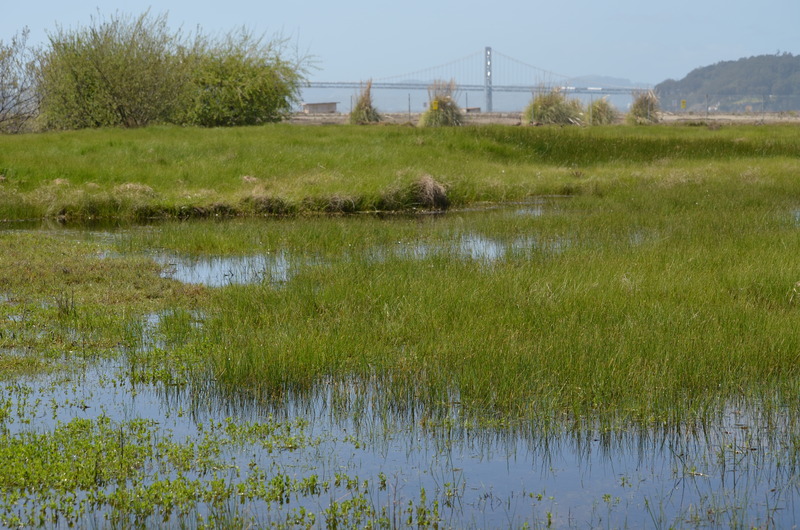 Preserves city resources – The proposal will help defer considerable Alameda Point related costs and responsibility to the city, already having multiple difficult challenges. Meets land use challenges – The land is not suitable for uses beyond open space and water-related uses. 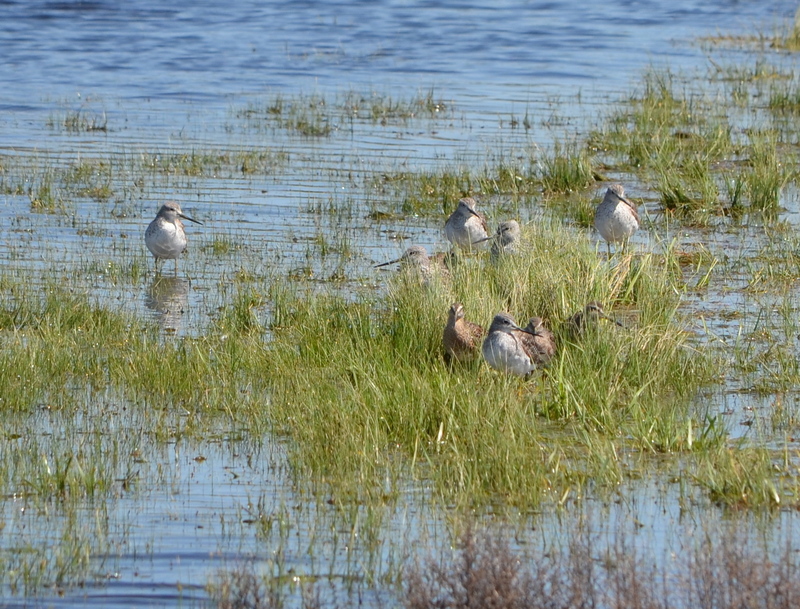 Current wetlands will require mitigation. Several issues surround this property that will meet challenges with most development proposals. 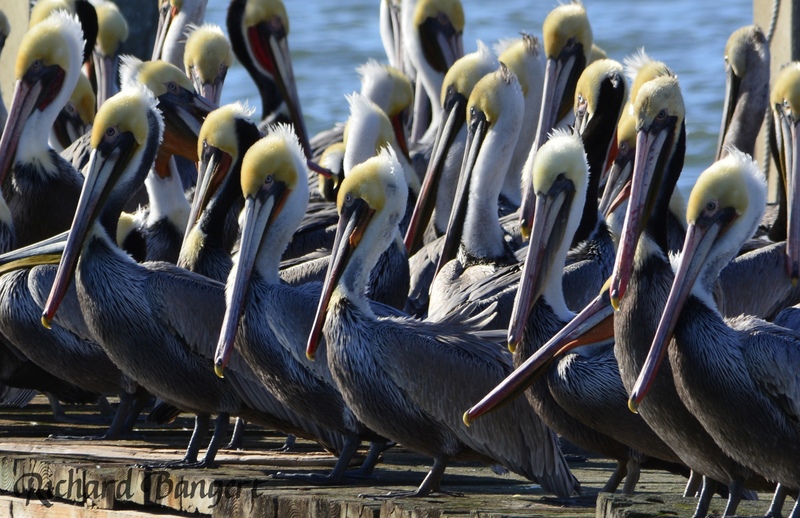 Enhances Alameda’s identity – Alameda’s military history, well-recognized wildlife history and resources, and East Bay shoreline location make this project the perfect fit to further enhance Alameda’s identity. The VA has spent millions of dollars to move their city-supported project forward. The proposal would allow them to see an end to conflicts that have stalled this investment. 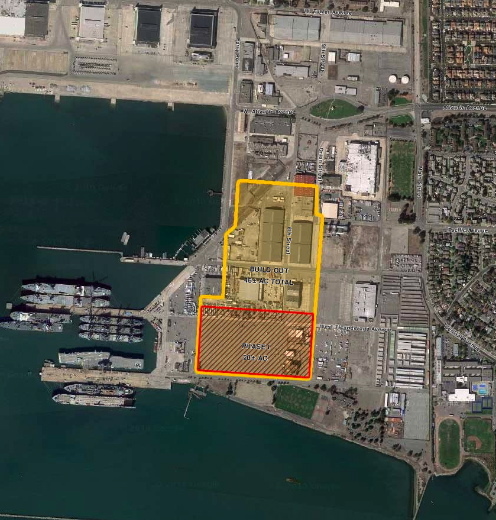 Alameda would finally become the home to the VA’s Health and Memorial complex. 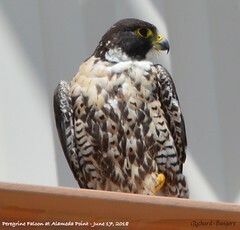 The City of Alameda has also invested time and thought to uphold a position that supports the VA facility and that endangered wildlife at Alameda Point are to have top priority. 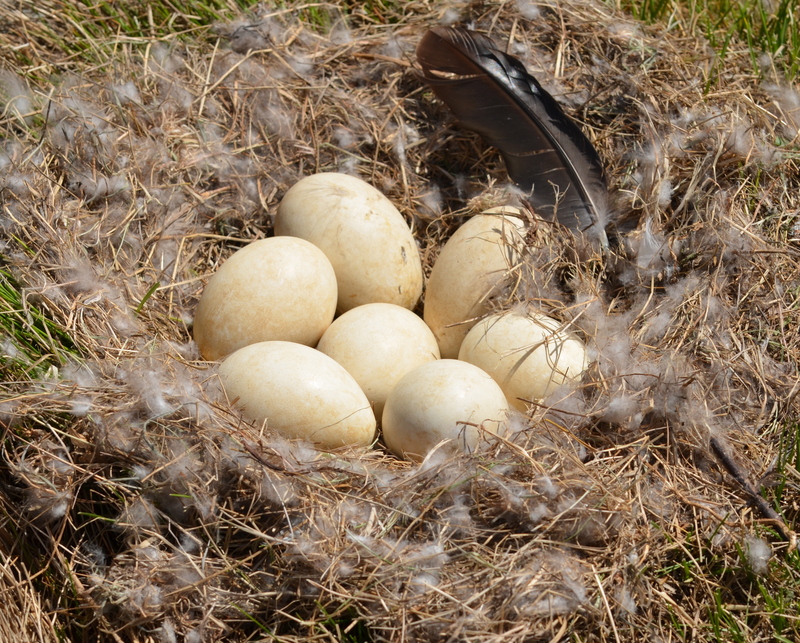 The Navy and Fish & Wildlife Service have invested time and money to maintain endangered wildlife species. EBRPD has spent time and money to develop a plan that would resolve difficulties in a way that would meet several positive goals. 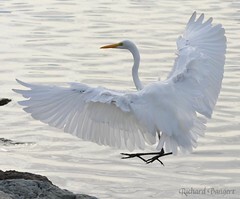 Golden Gate Audubon Society since the 1980s and Friends of the Alameda Wildlife Refuge (FAWR) since 1997 have been steadfast supporters of endangered California Least Terns at The Alameda Naval Air Station, later Alameda Point, ensuring continuous success of the colony. FAWR also provides annual elementary school Least Tern education at Alameda Schools. 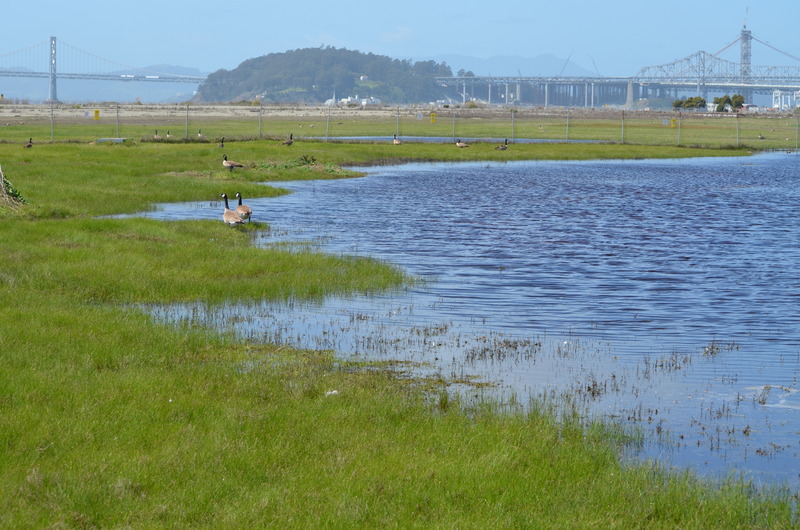 Others, like the Center for Urban Environmental Law (CUEL) at Golden Gate University, have worked to develop their Greenspace proposal for this beautiful location. Initiates Park District investment – To design and carry out the project will require an investment of many millions of dollars. 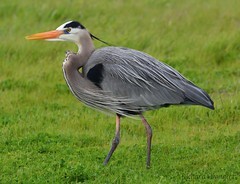 The city will benefit from this investment by EBRPD. 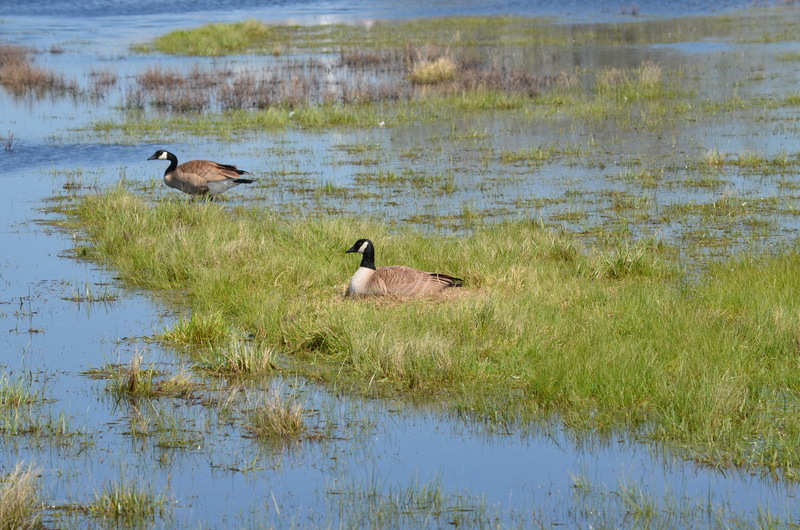 Enhances property values – Several studies show that wildlife refuges and natural areas increase values to nearby properties. 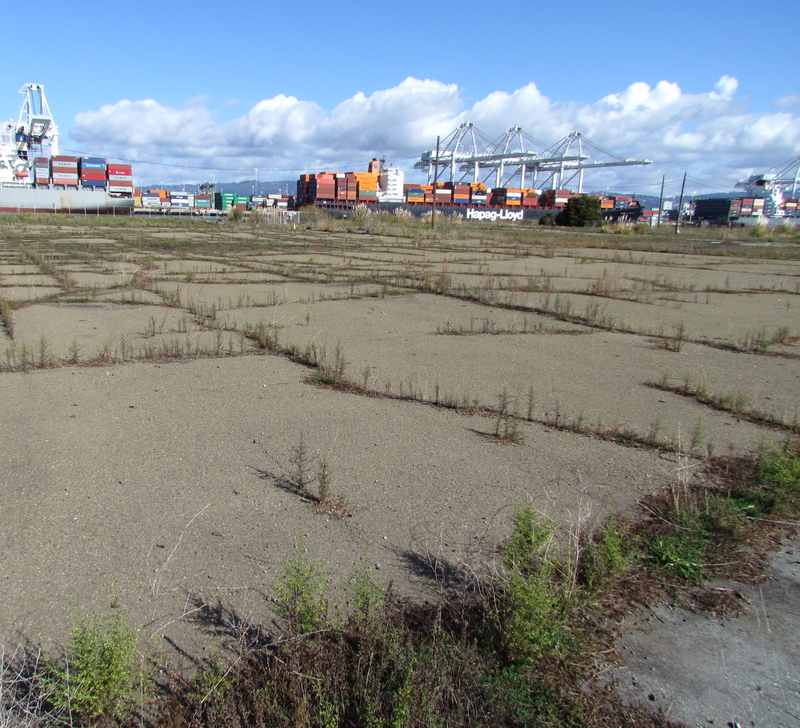 Attracts investors – The project will attract investors, spurring Alameda Point development. 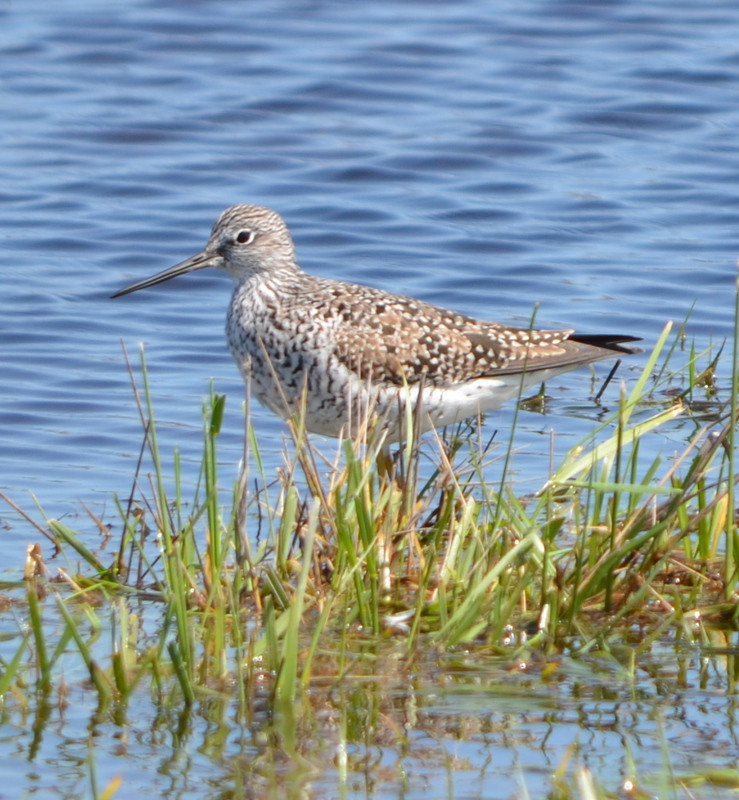 Strengthens tenant relations – Current tenants will appreciate that habitat management will have a broader plan and operation. Attracts tourism – The project – a San Francisco Bay destination point – will be a draw to local, state, national, and even world tourists. 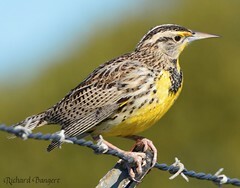 Brings local spending – The site will attract many welcome and diverse activities (photography, birding, hiking) that will benefit local merchants. 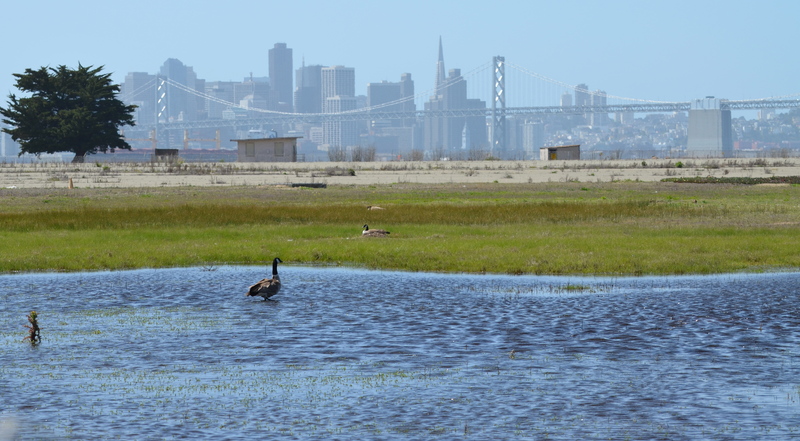 Adopts a workable solution – This is the only solution available that will allow both CA Least Terns and the VA project to coexist as adjacent Alameda neighbors. 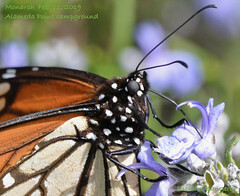 Satisfies community priorities – The project satisfies a strong wish of the public for natural areas and open space expressed during Alameda Point-Going Forward meetings held in 2010-2011. Creates inner-city showcase – The site will serve the community and others as a unique opportunity for inner-city nature experience and education. Enhances parks-to-resident ratio – Alameda’s Park Master Plan Summary (Draft, p. 25) states that the park-acreage-to-residents ratio is low (2 acres to 1000 residents; standard for CA cities is 3 to 6 acres/1000). This proposal would improve the ratio considerably. 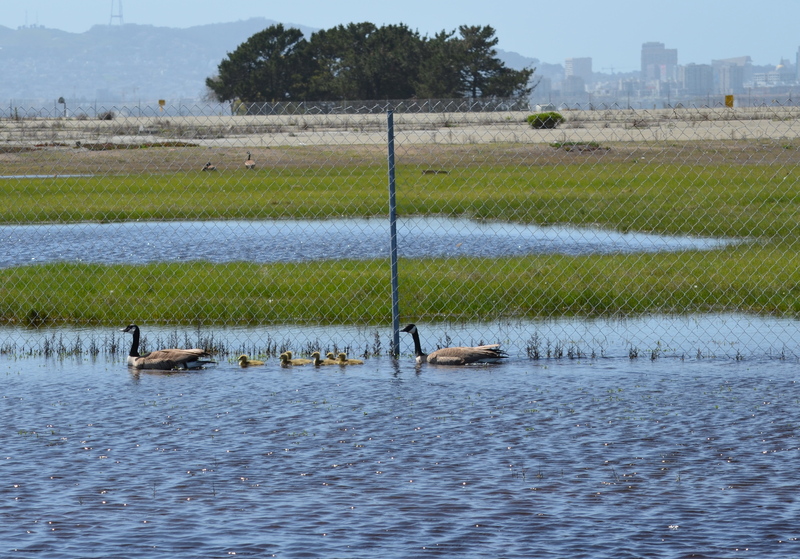 Builds on existing park district partnership – EBRPD has been a good partner managing Crown Beach, relieving Alameda of difficult tidal shoreline and beach management. We can count on them for similar assistance at Alameda Point. 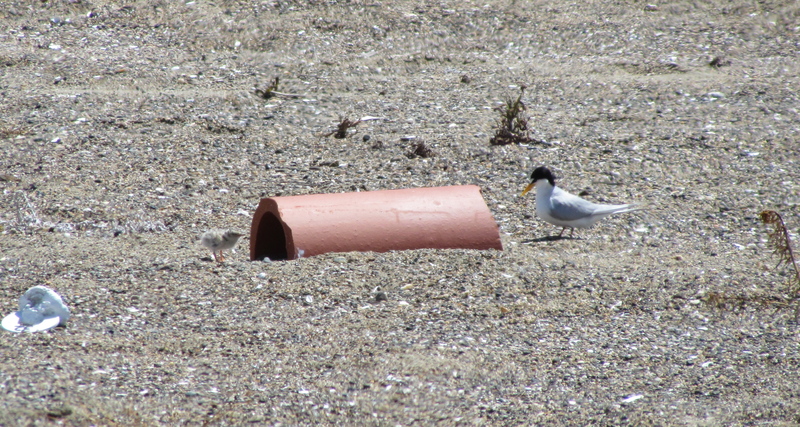 In conclusion: The CA Least Tern colony can’t be moved, and the VA facility can. The willingness of this unusual collaboration of stakeholders to work together is a testament to the importance of the project. It is rare and refreshing to see that people with diverse goals have the ability to work together to find a solution that satisfies multiple valued needs in difficult times. With the acceptance of this proposal Alameda will be a giant step closer to moving Alameda Point toward a promising future. We must not let this opportunity escape. The alternative would be tragic, a prolonged stalemate and unknown future. Alameda’s City Council can make this work. It will be a historical decision.